Whether your community is urban, suburban, or rural, headlines abound with stories of anxious, dangerous or even deadly encounters between law enforcement and civilians. While there remains much respect for police officers and the difficulty of their work, tensions with communities across the country have been on the rise. 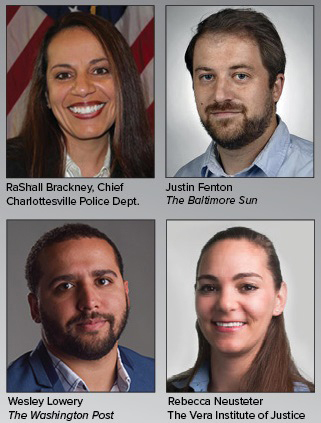 Join us for a conversation between Justin Fenton, Crime Reporter, The Baltimore Sun; Wesley Lowery, National Correspondent, Washington Post; Rebecca Neusteter, Director of Policing, Vera Institute of Justice; and RaShall Brackney, Chief of the Charlottesville Police Department that will touch on the history of law enforcement, effective models of community policing, and the role of both police and the public in this heightened time of mistrust in law enforcement. A member of the law enforcement community will also join the panel. Andrew Green of The Baltimore Sun will moderate the conversation. The event will occur in Falvey Hall at Maryland Institute College of Art. It is free, but reservations are required.